America Martin endeavors daily to capture this gorgeous and interesting world and the people in it with her art. She translates what she sees by holding and acknowledging the many moments and gestures of life through painting, drawing and sculpture. It’s not enough just to look. Jenn Hassin cares about the world we live in and is trying to figure out what we can do as a society to make it a better place. Her artwork is often focused on raising the awareness of important issues like veteran suicide, sexual abuse in the military, and mental health. Olaniyi Rasheed Akindiya is most well known by the name AKIRASH. He is a unique interdisciplinary artist who has few boundaries when it comes to what can best be used to tell the story he wants to share. Painting, sculpture, clothing and textiles, paper, installations, voice and music, and performance are all enlisted to create moments and places, with people being the most important piece. The annual Fusebox Festival aims to allow for a meaningful exploration and exchange between varied art forms and art communities by making space for what might only be possible in a live environment with other people. Each year Ron Berry and his team curate and paint onto the canvas that is the festival, a rich cross section of artists from different backgrounds and geographies into a diverse set of live event situations and performances. A lot of people don’t know what art therapy is but for those who do they probably understand and appreciate its power and potenial. Elizabeth Hendley, the art therapist at Dell Children’s Medical Center, might not think she is a saint but she is doing really important work. 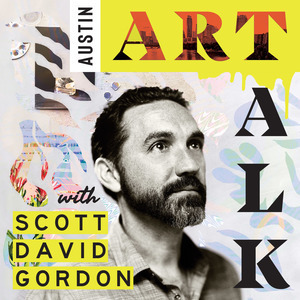 This conversation will enlighten you to the world of art therapy and inspire you to think about the ways you could incorporate it into your own life. If you get to the point in your artistic career where you are invited to help build a church out of ice in Slovakia for three weeks, you might think you have made it. But for Griffon Ramsey it is only a part of the beginning of the next exciting chapter. Deborah Roberts has had an incredible year with sold out shows all over the country and lots of press praising the her work and giving credit where it is due. She is best known for creating mixed-media portraits of young black girls, aged 8-10, that ask the viewer to consider how the subjects beauty has been imagined: by art history, pop culture, American history, and black culture. It's important work and it resonates with a lot of people. A raw and thoughtful conversation with contemporary artist Roi James about his life, work, and path through diversity to success. He specializes in creating sublimely beautiful abstract paintings and "Constructs" that are a combination of sculpture, painting, and architecture. Bale Creek Allen has chosen to live a beautiful and rich life and live by his own rules. He is a prolific artist with a great work ethic who creates art in a very diverse amount of ways and with many different materials. Bronze, neon, sculpture, painting, wood, photography, music, spoken word and theater to name a few. Michael Anthony García is a multidisciplinary artist, independent curator, and activist. His work takes many forms and attempts to addresses personal, local, and global issues, often highlighting those in this world who are marginalized, unseen, and under appreciated.